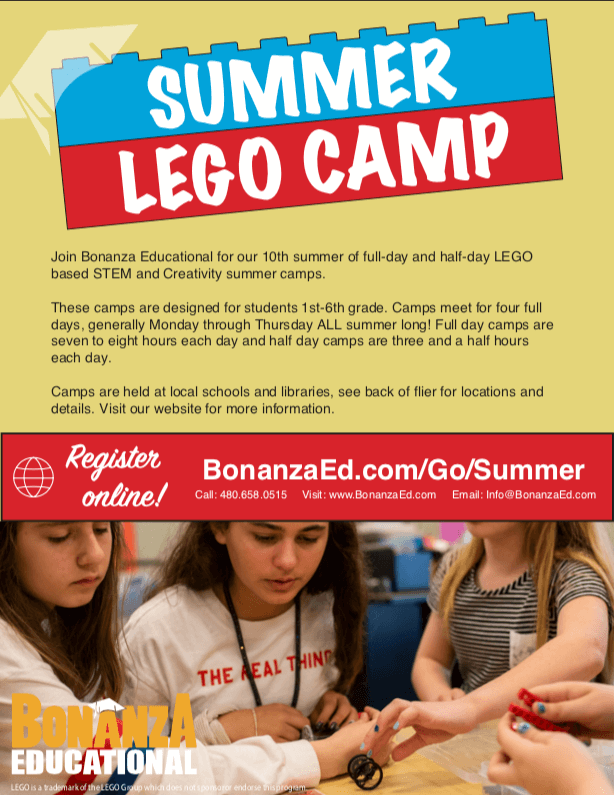 We are celebrating our tenth year bringing exciting, LEGO-based Summer Camps to you! 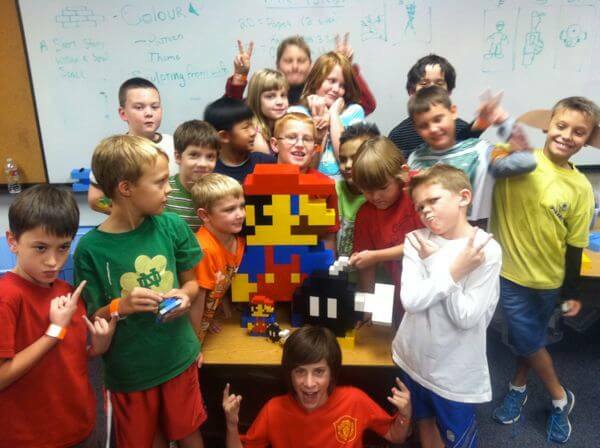 Our full-day camps feature seven, fun-filled hours of LEGO-based learning. Explore STEM and develop creativity skills through hands-on, team-based activities that will engage your camper in intense learning while making new friends and having tons of fun! Learn the concepts behind computer programming while your camper uses provided Apple Macbook computers and the LEGO Mindstorms system to build and program their very own robots. 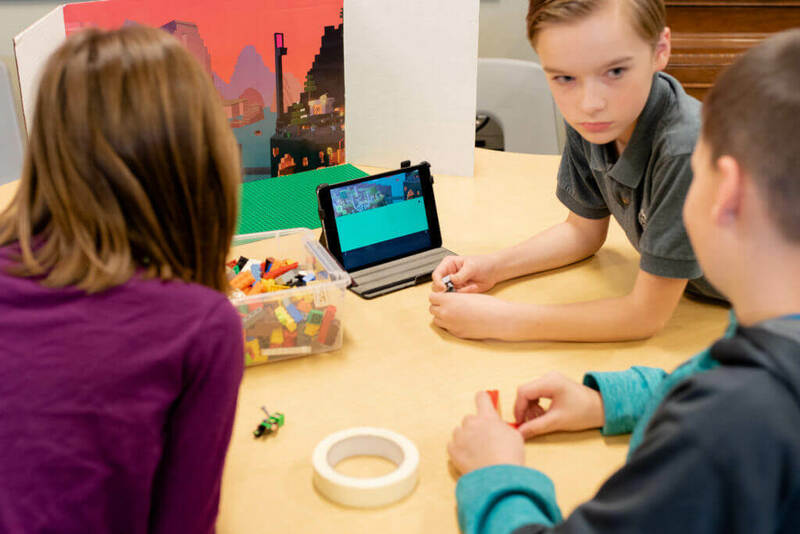 Your camper will learn the science behind movies, the art of story telling, and how to create their very own movies using Stop Motion Animation techniques. Then, they’ll make movies featuring LEGO characters with special software on our provided Apple iPads. 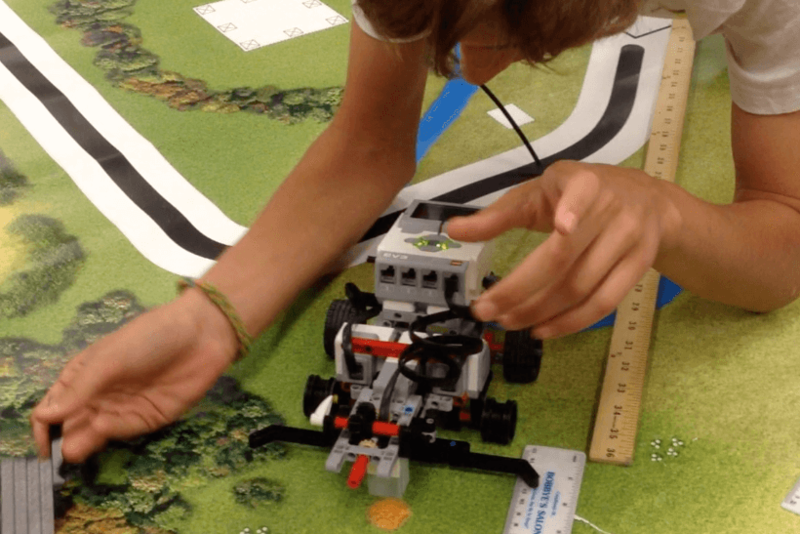 We’ll show your camper how to power up their LEGO bricks! 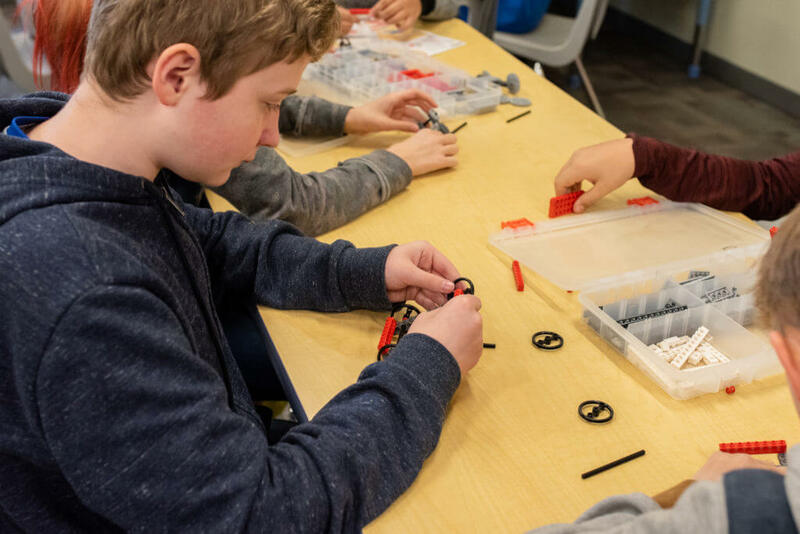 We will build models of machines using both LEGO standard and LEGO Technic elements that will teach them about the building blocks of engineering and how energy is stored, changed, and used by the machines that power our world. Your camper will explore their artistic side and create their very own art Masterpieces out of LEGO bricks! 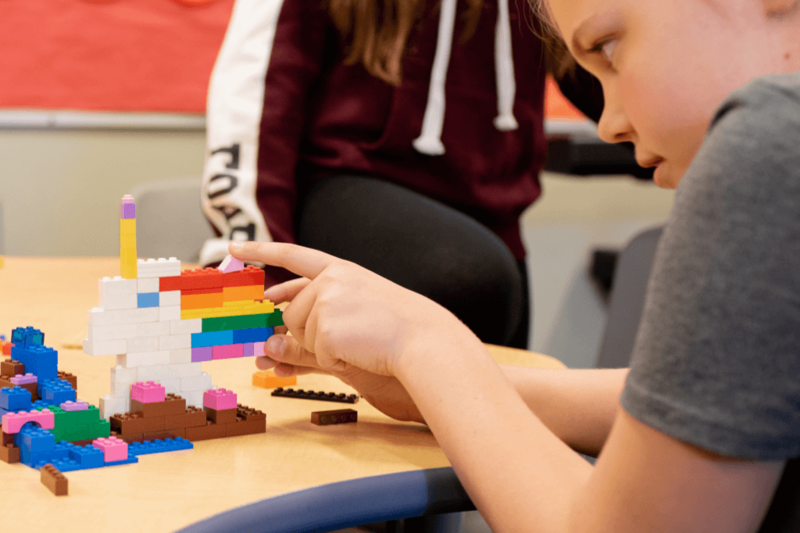 They will learn about the concepts and ideas artists use to express themselves and how they can apply those ideas and some LEGO bricks to create amazing works of art! One of the highlights of each day at a Building Bonanza! full-day camp is “explore hour”. “Explore hour” takes place during the final hour of each day of camp. Campers will team up and choose a subject they were excited about that day and, with the help of an instructor, they will get free rein to further tinker and study their chosen topic. No matter what they choose, campers will wrap up each day of camp exploring new concepts while expressing their interests in a safe and supportive environment. As camp progresses, all campers will use designated time to select, design, and create the “camp project” for the week. The camp project is a large-scale project that highlights some of the favorite things the campers learned during the week. 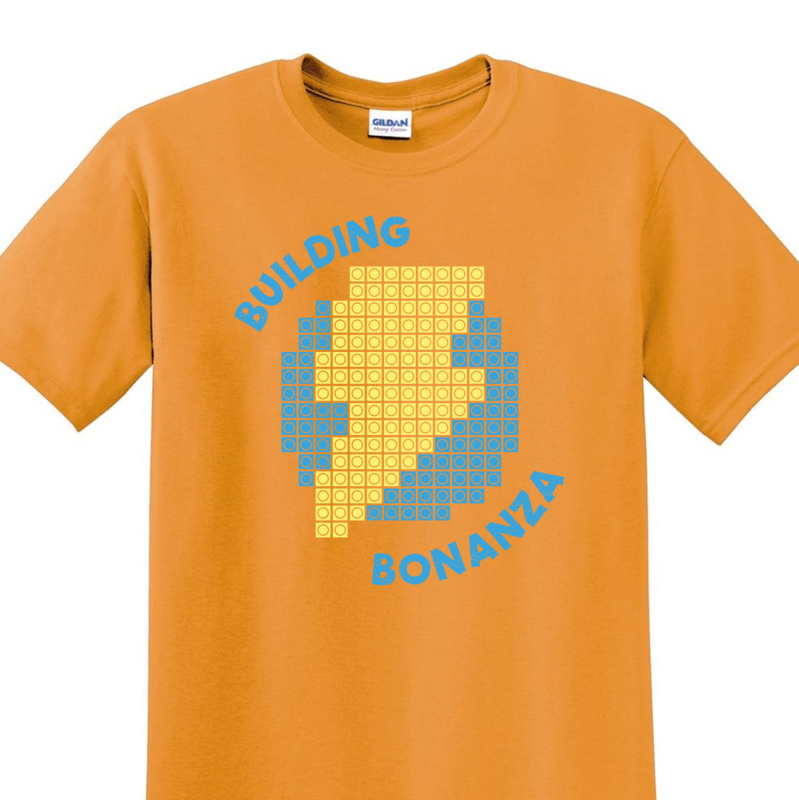 The first 12 campers registered at each full-day camp will get a free T-Shirt and water bottle. We will email you if you’re one of the first 12 around the week of May 15. * Simulated image. Actual t-shirt may look different. Sizes Youth Small to Youth Extra Large. Camp doesn’t have to break the bank! 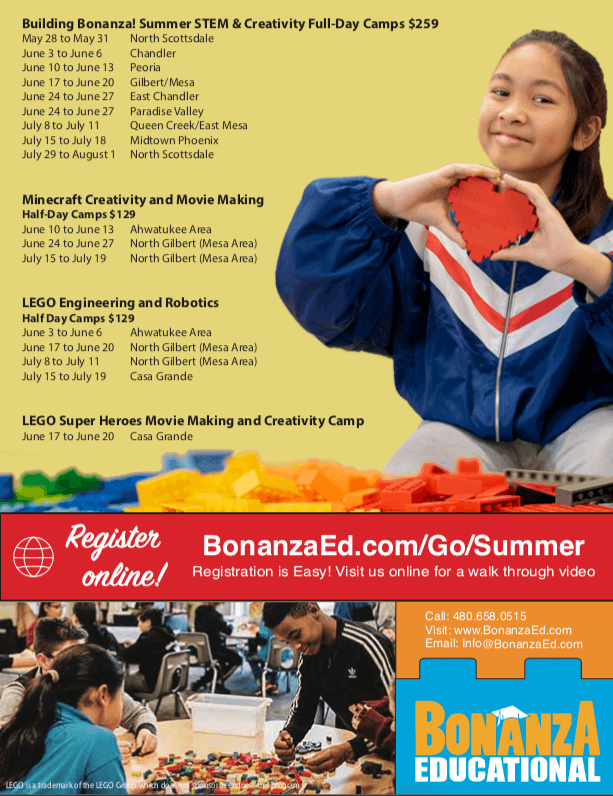 Not only is a Bonanza Educational full-day camp 30% cheaper than the average comparable camp in Arizona, but we also offer an easy payment plan! Our payment plan is easy! For a $5 fee, pay 50% now and 50% on the Friday prior to your camp’s start date. And yes, your payment plan registration DOES qualify you for the T-Shirt and Water Bottle offer! *Must use 6crickets.com to register, not available for camps co-hosted by our Chandler Unified School District community partner. What are you waiting for? Space is limited and you need to register ASAP! *Chandler camps must register using specific link below. If your child is a student of sponsoring school district, use the links below to register with your school district account, where available. Emergency medicine, ie: inhaler or Epi-Pen. Campers should be 6 years old and have had experience in school or daycare for long days. Campers can be as old as 14. The average age of campers in an average camp is 7 to 9. Our full-day camps include at least one first aid and CPR trained person at all times. There are no take home projects. Take only pictures and videos, leave everything else for the next camp! Recess is held twice daily, outdoors if the weather is below 95, and indoors otherwise. Snacks can be eaten prior to recess. Parents can visit at any time, and we encourage you to come early on the last day to see your camper’s Animation projects and the Camp Project. Save & Share the 2019 Camp Flyer! Download and share our camp flyer with your friends and family! Print a copy and put it on your ‘fridge so you don’t forget about camp! Full Day Camps too Much? Try Our Half-Day Camps! Half day camps are typically three and a half hours and cover only two of the four camp topics. They still feature one recess, a snack period, and a half hour of “explore time”. They start at $120 for a week of camp. There are fewer locations. Half day camps are great for students who cannot attend a full day camp, for students who may prefer a shorter day, and for parents who would prefer a more budget-conscious option. Register for Half-Day Camps in Kyrene Elementary School District. Register for Half-Day Camps in Casa Grande, AZ — opens 5/3. * Casa Grande, AZ program partially subsidized for residents of the community.